The entire background check industry is being heavily scrutinized right now – everything from the company that did Edward Snowden’s clearance, to companies that conduct criminal background checks. And yes, even online services like US Search, Intelius, Beenverified and PeopleFinders are getting in on the action. But just how accurate are background checks? While there are some online solutions that we would recommend avoiding, many of the companies out there are providing the best data they can and are legit businesses. What it boils down to is expectations and knowledge on the part of the consumer who is seeking information, or in many cases, ignorance. In today’s age there is no question that most everyone leaves a substantial digital footprint, some more than others and some less. Take for example the databases that I use as a private investigator. It is often very difficult to find information on someone above the age of 80 or below the age of about 16-18. Why? Well, because those that are 80 were more likely to have not received a social security number for a large part of their life because they were not used back then. And this person spent most of their life not buying into the world of digital and computer environments. They did it all the old-fashioned way – offline. Conversely, a teenager or younger hasn’t done much to leave a footprint. Even if they are on Instagram, they likely do not have credit cards, no legal filings, no drivers license for most of their life, etc. They just haven’t ‘hit the system yet’. In order to formulate the information for a background check, all of this data is extracted and or received from reports, applications, data mining and other similar means. Some entities are great at reporting anything and everything while others are not. Sometimes it is as simple as the subject filled out an application for something but the data was either misread or misspelled and basically ‘lost in translation’. So, by the time you search you are getting something slightly or altogether different. Remember the game you played as a kid where the class whispered a story in each ear until the whole story got all screwed up? Well the same scenario can happen here. Even with government agencies, some are great at reporting criminal record information, some are slow, some redact part of the data, and even a few will not provide any of it to the data companies. Different jurisdictions have different laws about what is public record or at least how far they will go to provide it. Some sheriff’s offices won’t give any information without a subpoena, not even simple things that clearly should be public record. Alternatively, I have found other agencies are an open book and give me plenty of information. This same thing happens with these data companies, they experience the same differentiation with different agencies. Yet another challenge is names, date of births (DOB), social security numbers and other private information that can either be common or entered in error. I can guarantee you there are a ton of people named James Williams in the systems, and some that may have the exact same DOB or at least close. Remember that the system cannot make those judgment calls and the company does not want to be responsible for excluding a mass murderers criminal record simply because it had a different DOB than the subject that was being queried by the user. It actually could be the person of interest and now they were just hired for a job at a daycare. A bit of an exaggerated example, but you see the point. Therefore, when I run a background search for someone, I usually do it through multiple database providers and often with different variations of a name or DOB until I am positive that I have the right person. But still, I cross-reference the results in order to eliminate what I feel is bad data and maintain that which can be confirmed. This takes some extra time but allows more accurate info for use in the remainder of the investigation. While it is a more costly proposition to pay the financial price for at least 2-3 background check services in your search, it is probably better than paying the price you might be up against if you make a false accusation. Should you depend on background checks? I hope this gives you a “look behind the curtain” at the background check industry. 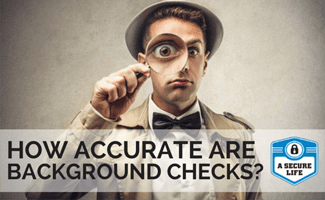 As you can see, it certainly is not an exact science, but if done properly, there is still a lot of information that can be obtained in a background check. Read our review of some of the online background check services available to everyday consumers, including US Search, Intelius, Beenverified and PeopleFinders.